We’d taken a stem back from the field to examine it. 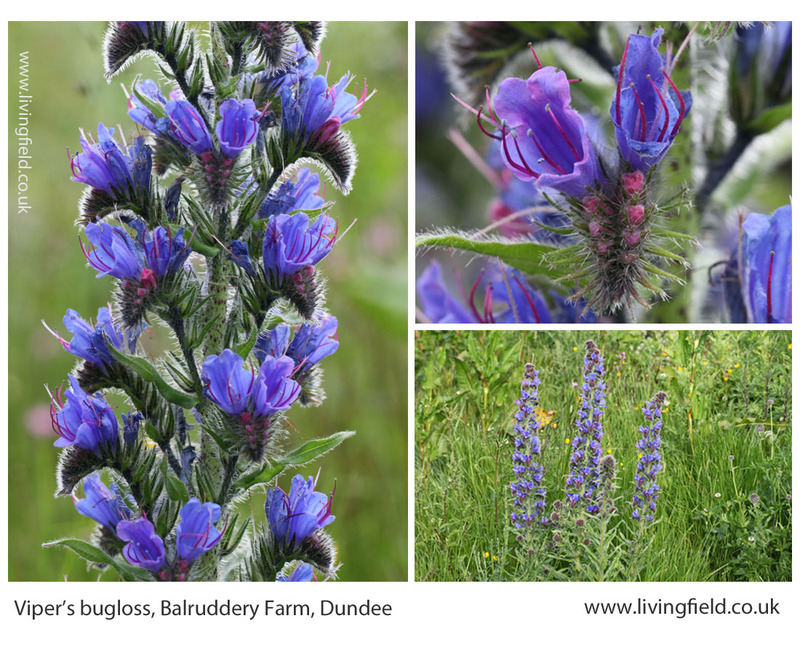 It looked close to Viper’s bugloss Echium vulgare, similar flowers and habit (images below), another species of Echium probably. It was growing profusely among what first looked like a field of oat, in Victoria, Australia. Then our host, Mrs McPherson, who knew the plant well said ‘Paterson’s Curse‘ and it turned out to be one of the most noxious weeds. Viper’s bugloss near the pond at the Institute’s Balruddery Farm, where it grows as a winter annual, germinating one year, overwintering and flowering the next. The borage family, to which Viper’s Bugloss belongs, is hardly a weedy problem in the UK. In his book on arable weeds in Britain, written well before the intensification of agriculture after the 1950s, HC Long  lists viper’s bugloss, corn gromwell Lithospermum arvense, bugloss Anchusa arvensis and field forget-me-not Myosotis arvensis among the borage family weeds of the 1920s, but none were harmful. Today, only field forget-me-not is common in the arable seedbank  but is still not among the top ten troublesome cornfield weeds. 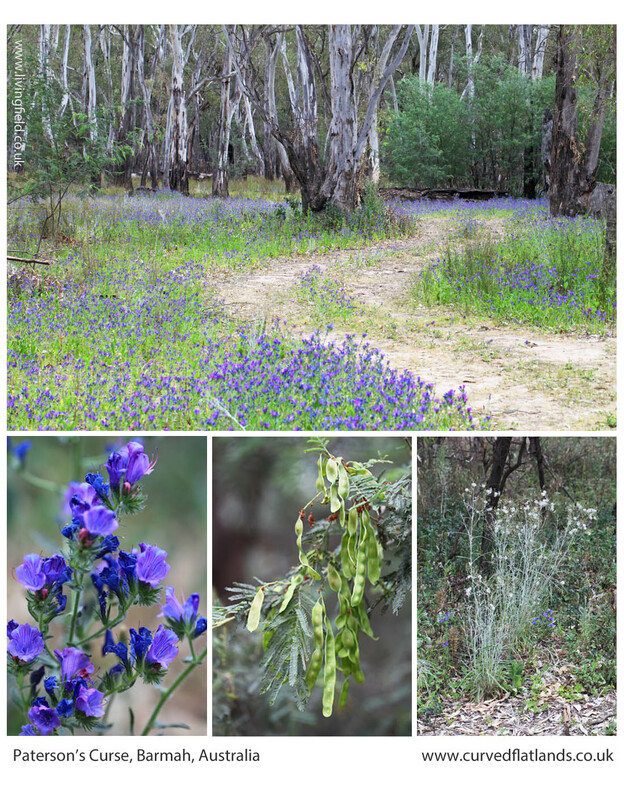 Paterson’s Curse Echium plantagineum remains a major invasive species and noxious weed of arable land in southern Australia, notably Victoria and New South Wales. It was not always there. It is from Mediterranean Europe and north Africa, but sometimes cultivated elsewhere as a garden plant for its blue flowers, for which it was taken to Australia. Then it spread uncontrollably . Here it is in the photographs below, growing in what is most likely a field of ryegrass, along with probably oats that self-seeded after a previous crop. 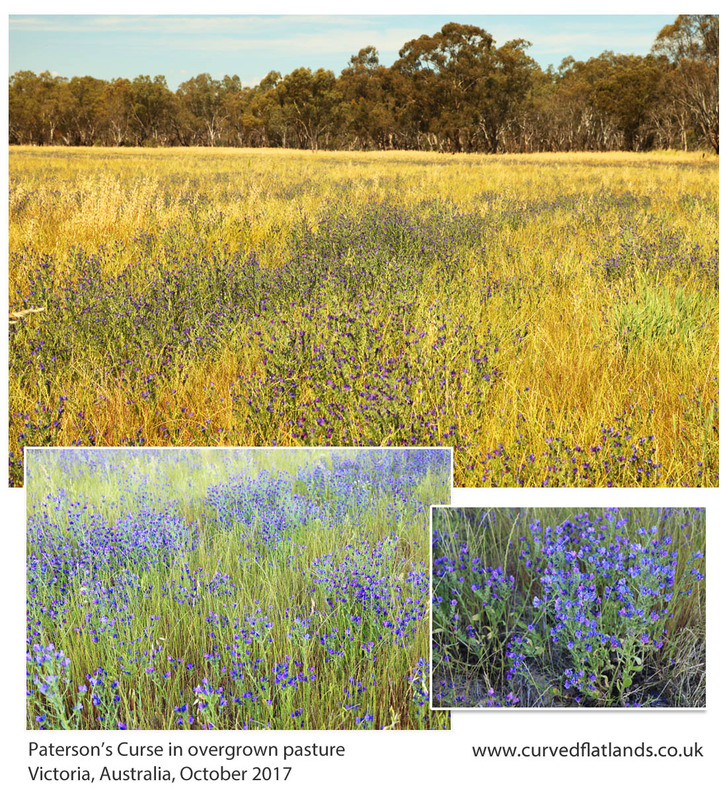 Paterson’s Curse is the blue-purple haze, growing in irregular lines and patches. 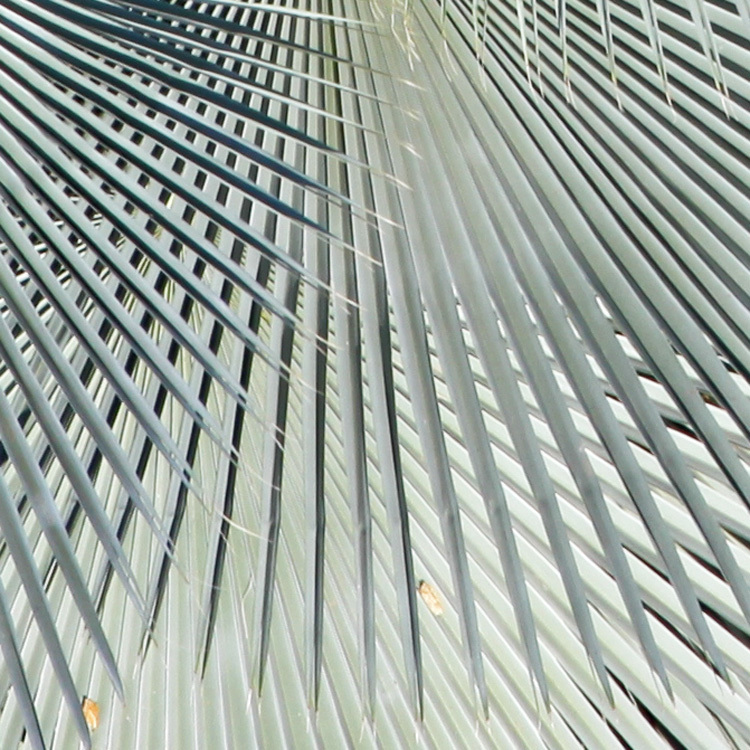 The plant is taken very seriously in south Australia as a weed of pasture and arable land. 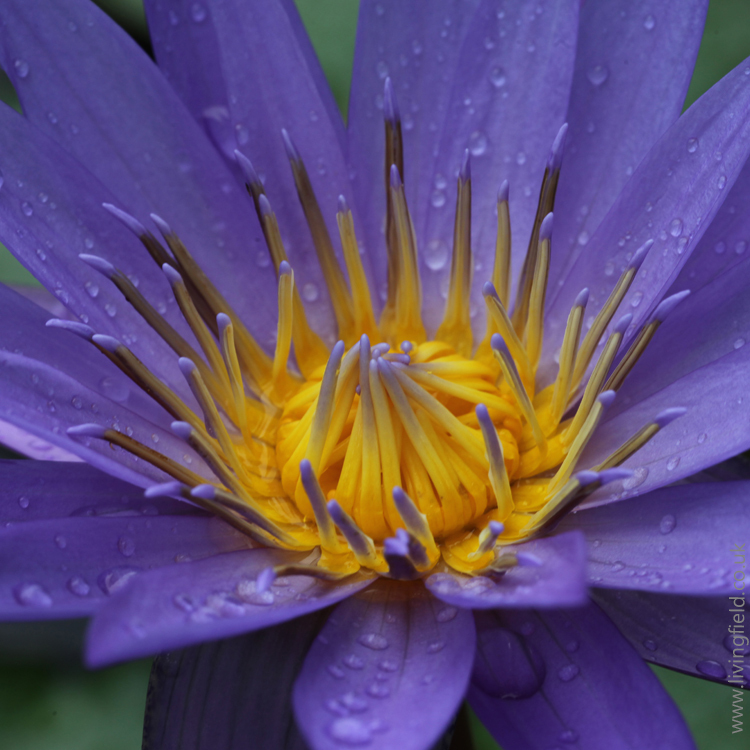 It competes for light, water and nutrient with crops and pasture plants, but is also a poison to some farm animals. It is a ‘declared plant’ listed in the Biosecurity and Agriculture Management Act 2007, and it is an offence to spread or transport it. Full descriptions are given, by national and state agriculture departments , including various means of biological control using invertebrates (e.g. 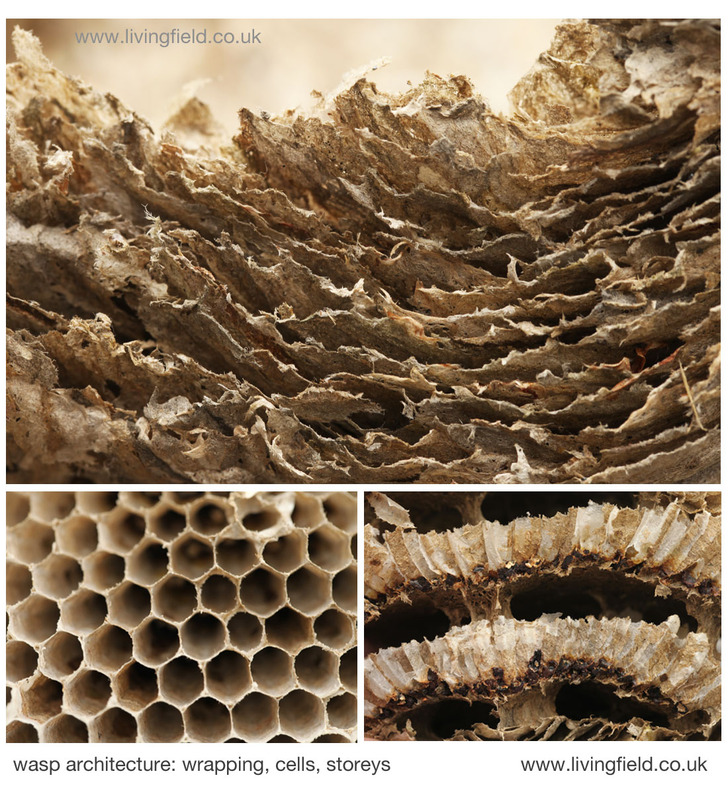 insects). It’s not all bad, however. Another of its common names, Salvation Jane, hints that it can assist in times of hardship, forming a constituent of pasture or hay that some stock animals can feed on, especially in dry seasons. The plant was also seen growing under the trees in a River Red Gum forest by the Murray River . It was profuse, lining dirt tracks, but also spreading out underneath the shrub layer. There were other weeds with it, notably some of the composite, legume and nightshade families. 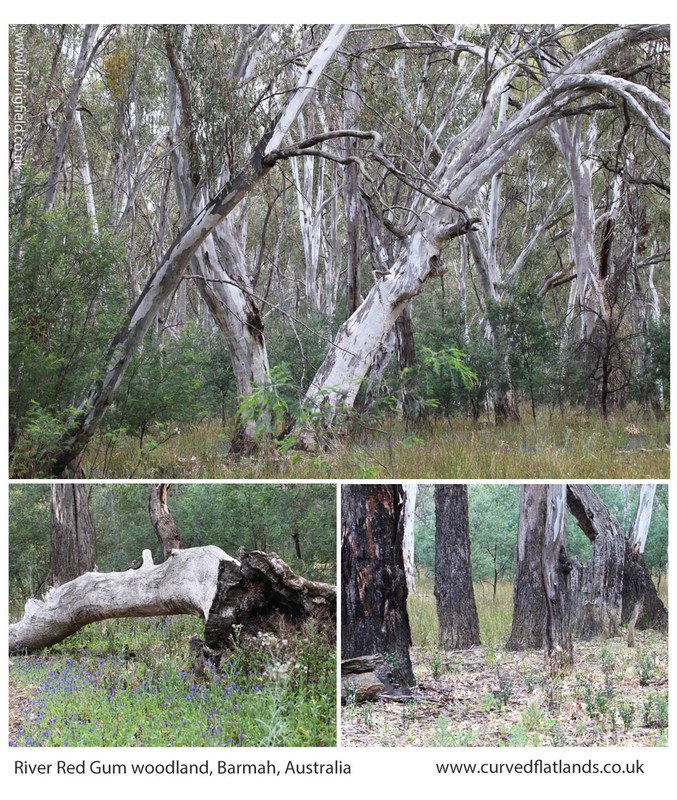 Paterson’s Curse lining tracks through river red gum and (lower) a flowering branch and two other understorey plants. Away from the tracks and under the denser canopies, it was less common, but still the occasional plant was flowering and seeding. Two years earlier, in the same month, there was no Paterson’s Curse to be seen here. Which raises questions as to how it became so abundant in 2017. Was it in the seedbank but did not germinate two years ago? If the seed was newly arrived in the area, how did it get there in such numbers? There were extensive floods recently, and it may be that the seed was brought down the river or else the floodwater covered nearby agricultural fields and picked up seed as it receded, depositing seeds in the forest near the river. There are many potential means by which the plants could have spread. Paterson’s Curse is a classic and costly example of a plant species that is barely an inconvenience in its native home, but finds spectacular opportunity in new territory. A bit like the rabbit and the fox. It’s no wonder Australia is cautious about its biological quarantine. Do we have weeds as bad as this? Britain certainly had its share of damaging weeds. Long  refers to the Corn Production Acts of the 1920s in which injurious weeds were named, and instructions given that they should be controlled, and if they were not, the landowner could be fined. He cites the counties of Surrey, Kent and Lancashire as having ‘shown very great energy in the matter’ of enforcing the Acts and bringing prosecutions. The named weeds were ragwort, spear thistle, creeping thistle, curled dock and broad-leaved dock. Thirty years later the same weeds were still causing trouble and were named in the 1950s weed acts. That was before chemical pesticides were routinely used and today the only one of them still spreading out of control is ragwort . But interestingly, ragwort is spreading not in managed agricultural land but along main roads, motorways and roundabouts, and also into rough pasture and along some minor roads leading into wild land. The 1950s weed act still applies, so complaints can still be made about landowners encouraging ragwort to persist and spread . Today, in Britain, and ragwort excepted, most botanical invasions are outside tilled agriculture and by perennial plants such as rhododendron and himalayan balsam (but that’s another story). Long, HC. 1929. Weeds of arable land. London: HMSO. Ed: Long wrote his book on arable weeds well before chemical control became the norm after the 1960s in the UK. His account is an essential guide to weeds and their management, mostly by cultivation and choice of crop, in the period before intensification of arable land between 1950 and 1990. 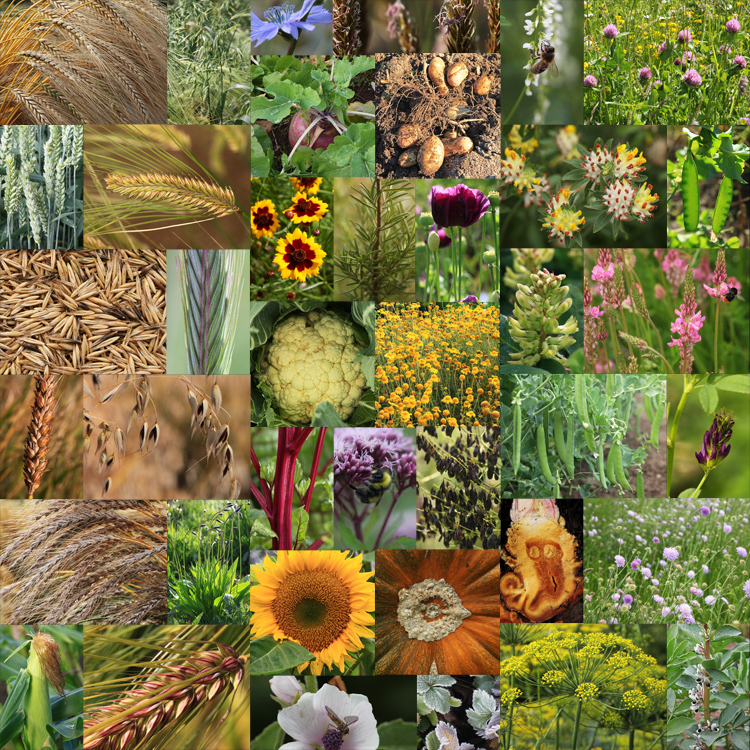 The seeds dropped by plants and buried in the soil form what is called a seedbank. Depending on the species, the seeds can survive for many years and then germinate when they are brought to the surface and conditions are right for them. The seedbank is important for survival is vegetation that suffers periodic destruction – such as burnt grassland or forest and land disturbed for agriculture. If no opportunities arise for germination, the seeds eventually die and the plant can be locally extinct. Most of the borage plant family in Britain can form a seedbank, but conditions in tilled fields have not been favourable to them and with few exceptions, they are rare in farmland. History, invasiveness, effects as a weed and poison, control and some stunning photographs of Paterson’s Curse’s ability to spread and cover, are available at the following web links: Agriculture Victoria; New South Wales NSW WeedWise; Govt of Austalia Dept Primary Industries and Regional Developmen. Barmah National Park protects a river red gum forest Eucalyptus camaldulensis by the Murray River in Victoria, Australia. Information at Parks Victoria. More on Ragwort Senecio jacobaea at The lone ragwort: late bee-haven. 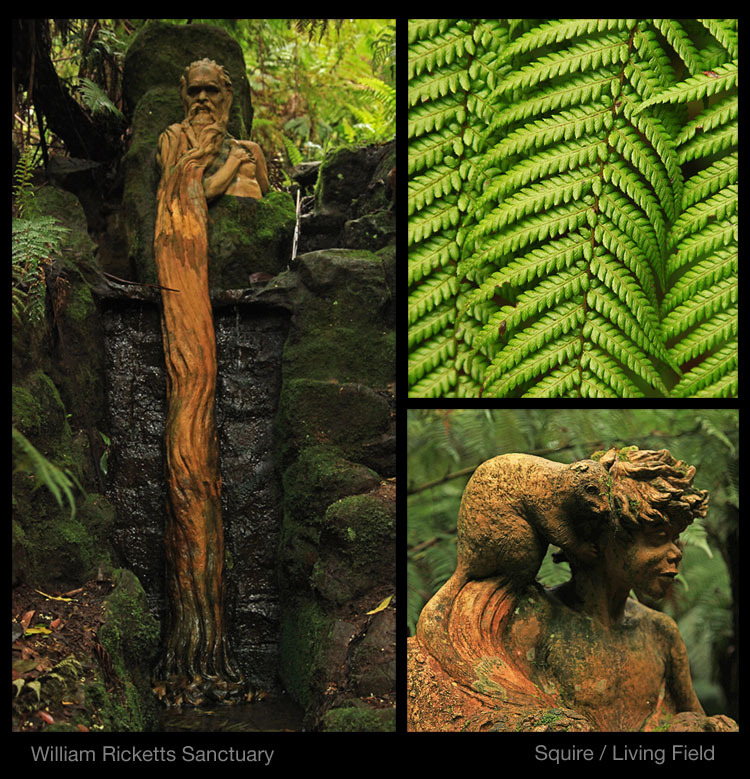 William Ricketts began in 1934 to create his Sanctuary in a hilly region of the Dandenong Ranges in Victoria, Australia. 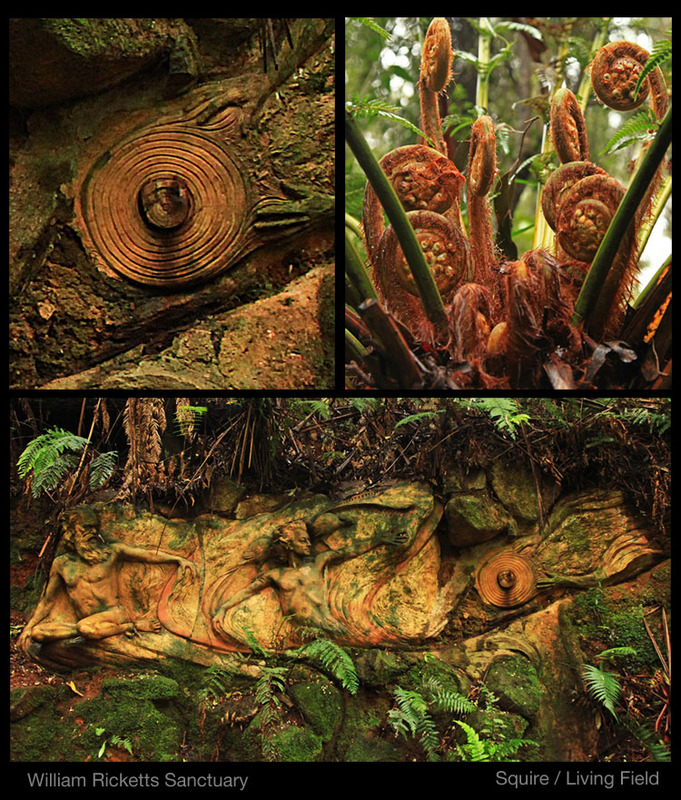 He fused fired-clay images, mainly of Aboriginal people, with the lie of slope and rock on a hillside vegetated with trees and tree-ferns. He believed that people could live together and with nature, and that destruction and exploitation were not inevitable. 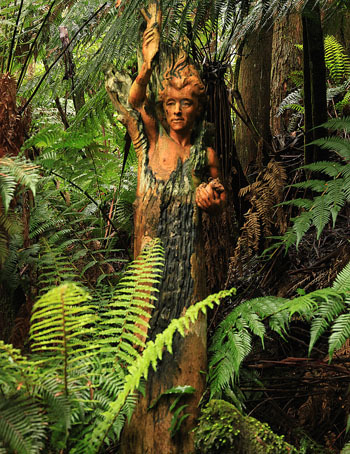 At the base are herbs, ferns and mosses, growing close to and in some instances on the sculptures. This proximity gives the site an organic feel, the images becoming part of the scene, aided by the artist taking casts of the rocks so that he could match the base of the clay precisely with its intended location. The clay images come alive in their setting. 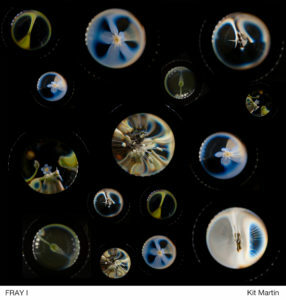 Many are part covered in a green algal film that must change with the seasons. Water droplets lie on them. Rivulets of water flow over them. 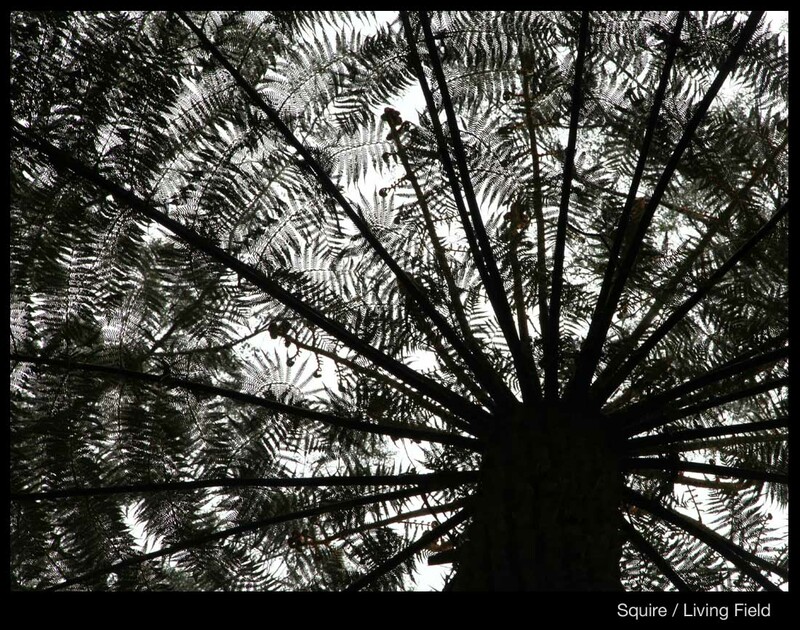 Insects and fallen leaves rest on them and they change as the gums and tree ferns filter the light. There are touches of William Blake in the way figures swirl and flow into each other. Ricketts was born in 1898, a little more than a century after the main phase of European colonisation began. He spent many years living with Aboriginal Australians, learning their approach to life and how they managed vegetation and land. He also created works for natural locations farther north, in central Australia. He died in 1993, aged 94. He lives through the Sanctuary, his various other works and a few writings, but most of all through the memories of people who have seen his works in their intended setting. The Sanctuary is managed by Parks Victoria. 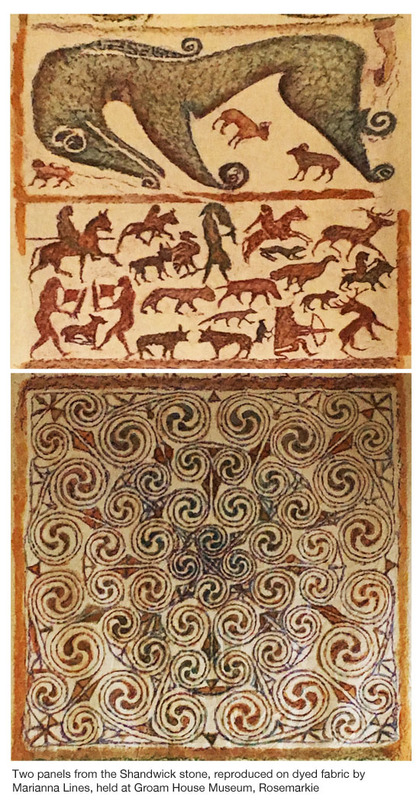 As with all other images on the Living Field site, images of William Ricketts’ works here are displayed ‘not for profit’ (taken October 2015). Brady P. 1995. Whitefella Dreaming: the authorised biography of William Ricketts. Published by Preferred Image. The Wikipedia entry gives further references. 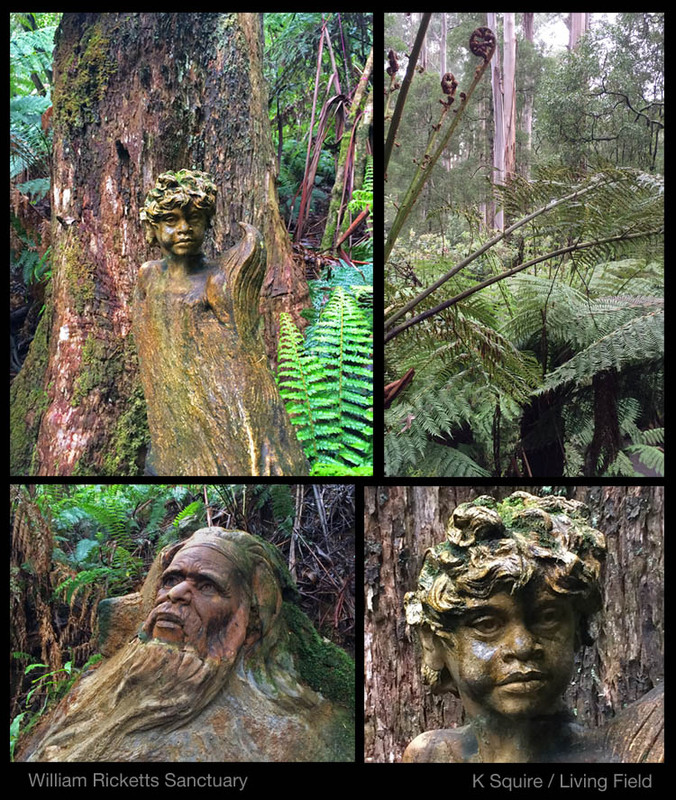 A sculpture at the William Ricketts Sanctuary, Dandenongs, Victoria, Australia. More … here.